Have You Purchased Your Cake Raffle Tickets? This event, brought to you by the very creative 4th grade bakers, will be held on May 17th. Raffle ticket forms were sent home via backpack and a link to download/print at home was included in last Friday's PTO Newsletter. Don't let your kids miss out on this 2nd annual "sweet" event. 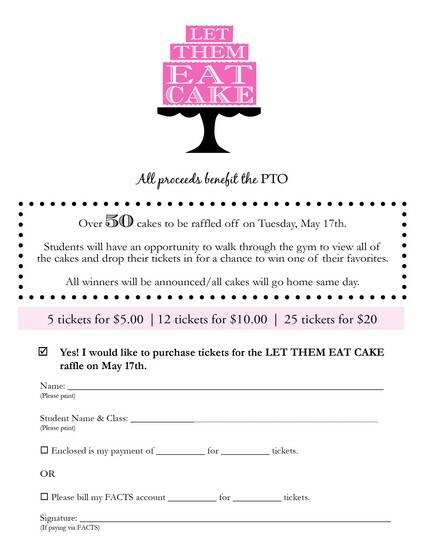 Click on the link below, or look in your child's backpack for a bright pink flyer to turn in by Friday, May 13th. All proceeds benefit the PTO. For more information or to volunteer, please contact Jill Rogers at jrogers010@yahoo.com.